McCormick County (pop. 10,233) is South Carolina’s smallest county in population and second-smallest in square miles. It was formed in 1916 from parts of Edgefield, Abbeville, and Greenwood counties. It is the only McCormick County in the U.S. The city of McCormick (pop. 2,783) is South Carolina’s fourth-smallest county seat. The McCormick train station dates from 1911. 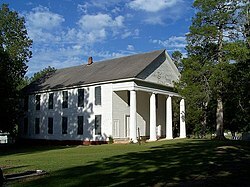 The Lower Long Cane Associate Reformed Presbyterian Church dates from 1856. Savannah Lakes Village is on Lake Strom Thurmond on the Savannah River, between South Carolina and Georgia. The lake was created by the construction of the Thurmond Dam in 1951-52. The unincorporated community of Modoc (pop. 256) was named for Native Americans from northern California who were moved to the area after the Modoc War in 1872-73.